It was September 7, 2010, when I volunteered to teach my native language (Tagalog) to six spouses of expatriates. Women of different nationalities – Chinese, Swedish, English, Indian, Japanese , a Canadian and myself – met regularly every Tuesdays from 10:00 to 12:00 in the morning which was later moved from 2:00 to 4:00 pm. The ladies took turns in hosting the class. I drove to their place in the enclave of the expats which is like a secret garden in the heart of our town. A sumptuous merienda was prepared by the host every meeting, while I brought my white board and marker, together with my desire to share my native language. I taught them Tagalog in an informal manner. I taught what I think would be helpful. The first few lessons were on common greetings, followed by useful words like market words, kitchen words, directions, colors, numbers and words that are needed in dealing with house helpers. After a year they became familiar with some common words that they could slightly understand what Filipino friends or utility men were talking about. They were excited to tell the class how people would get thrilled whenever they hear Tagalog greetings from them. Alongside teaching Tagalog is a rich cultural experience for me as well. The host mostly prepared their native food which opened my eyes to different cultures. I got familiar with various ways of preparing and serving food. All of them are excellent cooks and are also good in baking cakes and bread. We always enjoyed delicious snacks spiced up with lots of fun and laughter. It was not just learning Tagalog, but it was about friendship and a time well-spent. I always allowed them to say sentences in Tagalog and sometimes they came up with funny words and pronunciation. My Swede student would use the word “bulaklaklak” ( flowers) as if she was really right. But they have special liking for “maligamgam”, “malinamnam” and “nakakatuwa”. My English student (who has become my friend) was crowned Miss Excelente by the class for her facility to make long Tagalog sentences. She can also easily translate my Tagalog stories into English. 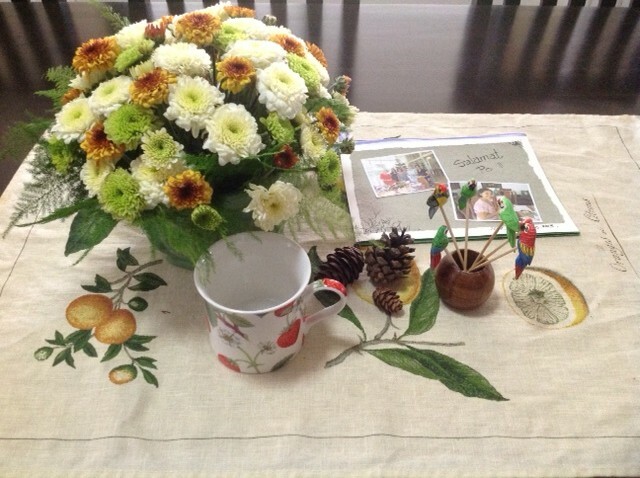 Once a year, we had two special gatherings, which resembled an international food festival. That was during Christmas and in before their home leave in June. My student from England would always open her house for this occasion. She would bake different kinds of bread and dessert. Each of us would bring a native dish. I always bring adobo and walnut fudge. In every gathering like that, they always gave me an appreciation gift. One time they gave me a basket of herbs because they knew that I love to have my own herb garden too. A super special gathering happened last February, when the ladies invited their husbands for dinner in honor of our Tagalog Class. Their husbands are big bosses in their offices but they, together with husband willingly joined the fun of the Tagalog class ladies. Sad as it is, the Tagalog class has to end. It was difficult to say goodbye. But I needed to say goodbye for the mounting task that I have right now. Due to shortage of teachers, I heeded the call for me to teach an education class in UPLB, where I got my PhD degree. With my ministries in my church, I have to let go of other responsibilities, lest I spread myself too thinly. But in close to four years of teaching Tagalog , I learned a lot as well. In giving, there is much joy. In sharing the gift of God, you get more in return. My pocket could have been thicker by a few thousand pesos – had I asked for payment – but these could have been spent for things that will soon fade away. What I really got were treasured memories with my international friends. I also earned the friendship of my English student. A few hours before she left for England, she took the time to see me and gave me a special pottery cup, for “your office” she said. She is very appreciative and thankful, very thoughtful and kind. As for the Tagalog Class, she said that the ladies agreed to still meet as before, and I can see them from time to time. ”Something good that you’ve started should not end like that. It has to carry on.” My Tagalog Class has not ended after all.